Do you feel like you have a lopsided life? Good. You’re normal! Instead of constantly trying to “fix” our lives by achieving some perfect balance that doesn’t exist, let’s dump the guilt and admit that we need to lean into God. His perfect plan for us includes seasons of life when we may be more focused on caring for our children or our elderly parents, working for pay, or volunteering at church. Free to Lean gives you permission to recognize the season you're in and live in harmony with it. 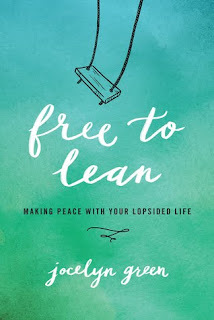 "Free to Lean" by Jocelyn Green is a breath of fresh air. It is a book that is welcoming and inviting as we Jocelyn invites the reader into her life, her stories and let's us know that it's okay to be imperfect. She doesn't simply just expect us to have everything all together, nor does she even pretend to do so. She openly shares that she doesn't and comforts the reader by letting you know that 1) you're not alone, 2) It's going to be okay and 3) You can't do it all. I loved letting the third one sink in. Sometimes, I feel like it all depends on me, when it doesn't, but it solely depends on my obedience to God. This book is meant for wives, moms, friends, daughters, sisters, small groups, etc. I love the book is written and would love to do this as a small group with a group of women. I felt a sense of peace while reading this book and also I felt that she smacked me with some hard, but good truths. I highly recommend this book and it has found a permeant spot of my shelf. You'll mark it up with highlighters, sticky notes, etc. I give this book 5/5 stars. Thank you to author for providing me a complimentary copy for review purposes. A favorable review was not required. Jocelyn Green is a former journalist who puts her investigative skills to work in writing both nonfiction and historical fiction to inspire faith and courage. 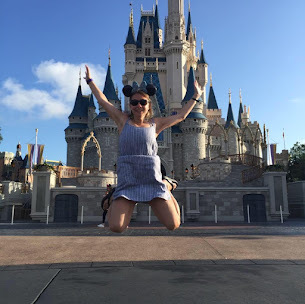 Her books have finaled in the Christy Awards and Inspirational Readers Choice Awards, and have won gold from the Military Writers Society of America and the Advanced Writers and Speakers Association. Complex and nuanced characters, rich historical detail and twisting plots make her novels immersive experiences. Her fiction has been praised by Historical Novel Society, Romantic Times, Library Journal, historians specializing in her novels’ time periods, as well as popular and acclaimed authors Laura Frantz, Lori Benton, Jody Hedlund, Sarah Sundin, Joanne Bischof, Julie Lessman, and more. Jocelyn loves Broadway musicals, the color red, Toblerone chocolate bars, Mexican food, and well-done documentaries. She lives in Iowa with her husband, two children, and two cats she should have named Catticus Finch and Purrman Meowville. Visit her at jocelyngreen.com, and receive a free gift when joining her e-newsletter mailing list at jocelyngreen.com/subscribe.